microplates and test tube (cuvettes). 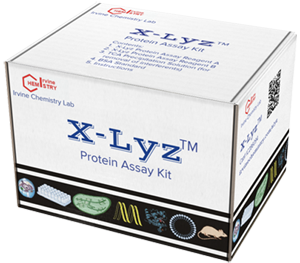 Bradford assays, are lower than 2000µg/mL. sample size 25 µL and WR/Sample 10/1 in 96 well microplate. agreement with the true values as shown in Table 1.
does not require to generate standard curve each time. conducted over a year using the same standard curve. 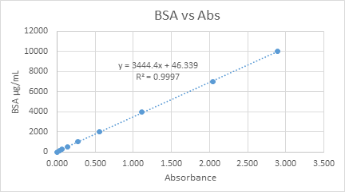 True Values: The true concentrations of BSA samples in µg/mL. Average Absorbance: Average absorbance in five replicates. Estimates: Estimates of sample concentrations. Deviations: Percentage deviations of the estimates over the true values. 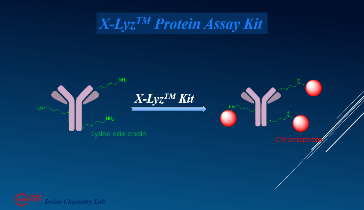 different proteins compared to other assays (Table 3). Concentration: The true concentrations of the tested proteins samples. Average: The average deviations of the estimates in twelve assays. Minimum: The minimum deviations of the estimates in twelve assays. Maximum: The maximum deviations of the estimates in twelve assays.